Written By: Alan Downs, Ph. D.
Narrated By: Alan Downs, Ph. D.
The most important issue in a gay man's life is not "coming out," but coming to terms with the invalidating past. Despite the progress made in recent years, many gay men still wonder, "Are we better off?" The byproduct of growing up gay in a straight world continues to be the internalization of shame, rejection, and anger, a toxic cocktail that can lead to drug abuse, promiscuity, alcoholism, depression, and suicide. 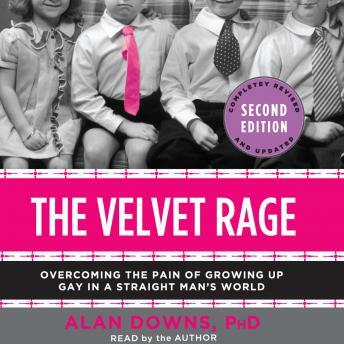 Drawing on contemporary psychological research, the author's own journey, and the stories of many of his friends and clients, Velvet Rage addresses the myth of gay pride and outlines three stages to emotional well-being for gay men. The revised and expanded edition covers issues related to gay marriage, a broader range of examples that extend beyond middle-class gay men in America, and expansion of the original discussion on living authentically as a gay man. by Alan Downs, Ph. D.